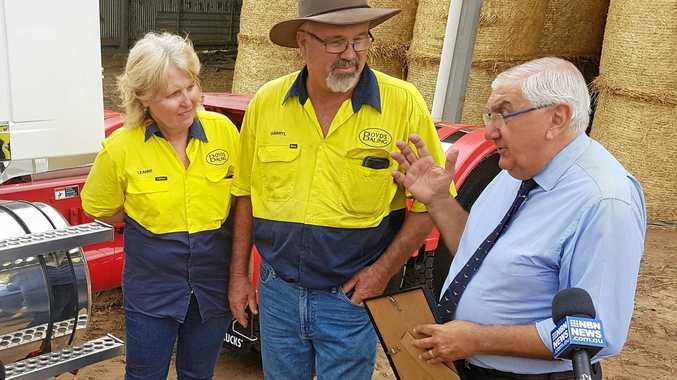 THANKS: Darryl and Leanne Boyd, of Boyd's Baling, are presented with a certificate of appreciation for providing emergency livestock fodder to the Tenterfield Shire Council area during the drought and Tabulam bushfires. WITH only a few days left as the Member for Lismore it was very special to be able to turn the first sod with representatives from Lismore City Council and Lismore Citizens Review Group on the Lismore Flood Project. LCC is ready to go on the excavation behind Lismore Airport, which will see 410,000 cubic metres of soil removed, allowing water to flow from Leycester Creek behind the airport to re-enter the river system below the city. Many business operators have told me their futures are uncertain in Lismore if nothing is done to reduce the flood risk. The NSW Government has taken the politics out of flood mitigation by making sure this first stage of works is funded and started before the election. I am glad to have been able to work with the community to get these mitigation works to this stage. One of the things I will miss most in retirement is the fantastic people I get to associate with day-to-day. Last week NSW Premier Gladys Berejklian and Deputy Premier John Barilaro came to Lismore to make an important $1.5million funding announcement to stimulate Lismore's CBD. While here I took them out to Goolmangar to meet and present Darryl and Leanne Boyd, of Boyd's Baling, with a certificate of appreciation for their support in providing emergency livestock fodder to the Tenterfield Shire Council area during the drought and Tabulam bushfires. Thank you to everyone who has lent a hand to our landholders during this tough time. This will be my final column in the Echo as the Member for Lismore and I want to say how much of an honour and a privilege it has been to be your elected representative over the past 20 years. Together we have achieved a lot, especially while we have had a voice in government, but for me it has never been about the bricks and mortar but being able to support individuals in their time of need. For this level of representation to continue we need a strong voice in government and that voice is Austin Curtin. When you head to the polls this weekend make sure you secure our region's future by voting 1, Austin Curtin for the Nationals.